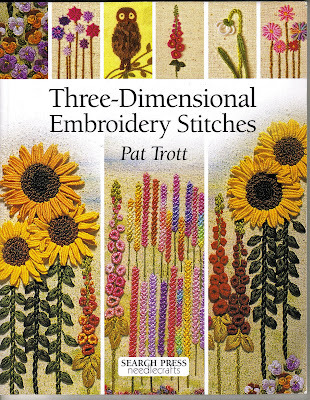 Three-Dimentional Embroidery Stitches, written by Pat Trott, is the book I used for the pansies the other day. I had never heard of it when I bought it - it was strictly an inpulse buy - but I am so pleased that I picked it up. It is not a huge book, only 62 pages, but it has great stitch instructions for bullions, cast-on buttonhole, whipped spider webs, etc. 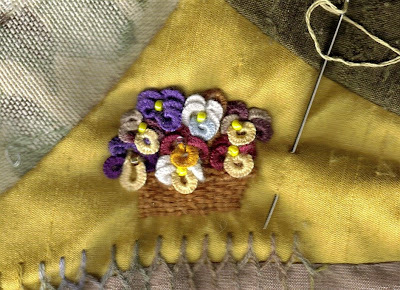 Following that is a sampler of flowers with the stitches used to make them. There is more information in the book as well but I haven't explored all of it fully yet. I think it would be a useful book when embroidering landscapes. At under $20 it is a good price for the information it contains and I was lucky enough to pick it up at Michaels with their weekly 40% off coupon so I am pretty sure JoAnns would carry it as well . Funnily enough I received my email from Amazon yesterday with their recommendations based on my previous book purchases and guess what their #1 recommendation was for me - this book! lol I guess it was meant to be that I find it one way or another! I have been working on a little six inch block of Leslie's and was excited to find what I thought were boullion pansies in one of my books. On closer look though, they were made with a cast-on buttonhole stitch so had to learn that one! lol I made a little woven basket for them with boullions for the top rim and handle (which have both pretty well disappeared under the flowers) and then wove the bottom of the basket. All that was in two strands of DMC. Then I made the pansies in an assortment of colours also with two strands of DMC and little seed beads for their centers. Since I love pansies I really enjoyed making this! I have just had the pleasure of working on Sharon's block in this round robin. The theme for Sharon's block is "Mother and Child" which had me a bit stumped. When I saw the print of the little girl and her doll though I thought it was perfect. Playing with dolls is, after all, how we all started to learn the nurturing ways that we use later in motherhood. I gathered some Mokubo ribbon I got the other day to frame the silkie I made, using beads to secure it. Then I added some tiny velvet leaves and added a scattering of silk ribbon flowers. The other motif I did is a heart made up of bullion roses. I finally learned how to do the bullion stitch so can't wait to use them on everything! I used french knots and detached chain stitch leaves to fill in the gaps in the heart. This motif was inspired by one in the book, "A - Z of Bullions". I only did one seam treatment on this block and it was a double herringbone. I added french knots, lazy daisy stitch and straight stitches. This was the first block I have worked on in this round robin. I can't wait for the next one to get here now! After a great Easter weekend, full of family fun, I am getting around to posting a picture of the work I did on Simona's block in this round robin. I think I was overly ambitious and might have bit off more than I could chew, but it was to try to challenge myself. So, although it is far from perfect it is my best at this point in time and that is what I try to do on each round robin - my personal best. 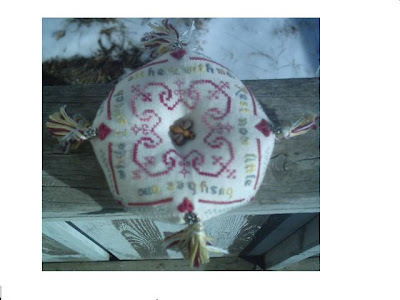 I'm not a beader so this "all beaded" round robin is new to me. 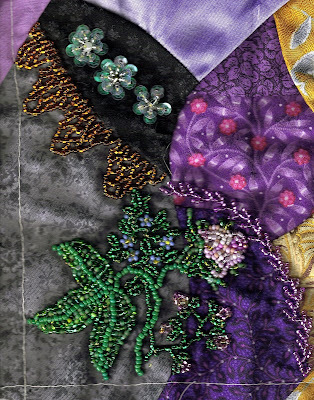 The flower motif is inspired by the A - Z Beaded Embroidery Book. The feather stitch is my favourite beaded seam treatment that I always fall back on. I tried to do a lace stitch seam above - attempting to convert this seam treatment that is very popular recently at CQI, into beads. The last motif I did on the little black patch were three of the sequin and bead flowers from new my favourite book I have mentioned before - I love these little flowers! lol I hope Simona will be pleased and now I'll wait for the next block to arrive in the mail. I just finished this litle biscornu for a swap in one of the online groups. I really enjoyed making it and can see where these can become addictive. 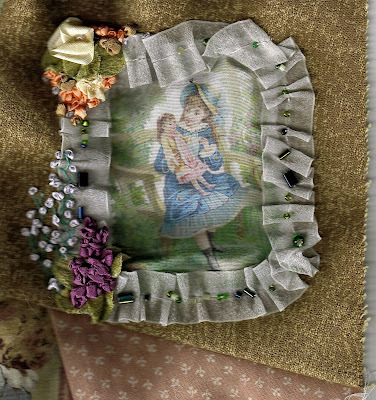 To give credit where credit is due, it is from a kit by Indigo Rose called The Bee Charmer. Now, I did change the threads, the fabric, the button, etc Well, basically everything but the pattern and the little beads to stuff it with! I love this kit - it was the first biscornu I had seen and is still my favourite. 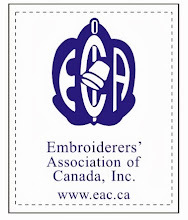 I found the kit at my favourite stitching store in Calgary, Too Busy Stitchin'. It is going off in the mail today and I hope it's new owner will enjoy it as much as I enjoyed making it! This is another round robin block put to good use. 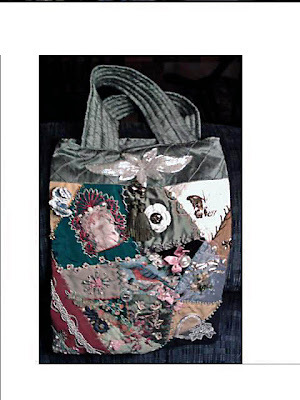 I have made a tote-like purse for an organization called "Grandmothers for Grandmothers" - even if I am just a wannabe grandmother! Grandmothers for Grandmothers auctions off purses and the proceeds go to benefit a generation of grandmothers raising their grandkids in Africa because of the loss of parents to the AIDS epidemic. I think it is a worthy cause and I hope someone bids on this purse and it makes a bit of money to make a bit of difference. This block was created by the lovely ladies of the now defunct group, 3Q. 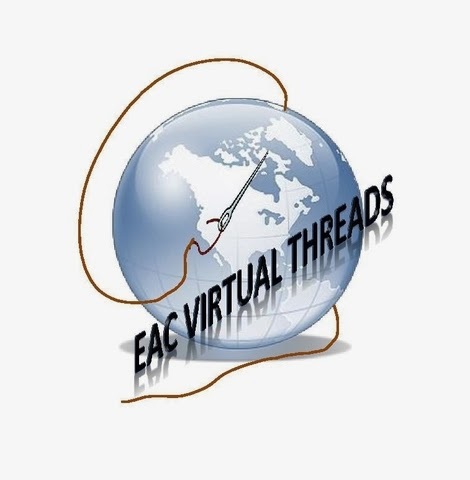 Thank you to all involved for your stitching! Here is Ms. Bamboo in all her glory after my friend, Dee, sewed and stuffed her. Ms. Bamboo was the product of a cq teddy bear round robin and took two years to make the rounds but some things are worth waiting for I guess. 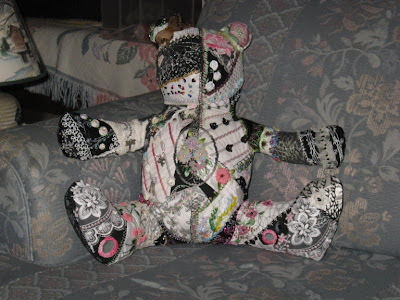 This teddy bear was destined for Dee's panda loving daughter, Emily, from the very beginning. She was pieced all in black and white like the pandas Emily loves and as she made the rounds, and then made the rounds again, everyone who stitched on her did so with Dee, Emily and pandas in mind! 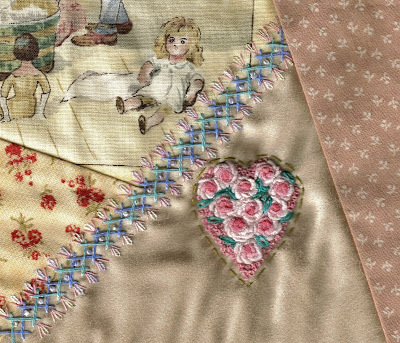 There is some beautiful stitching done by friends whose work I admire to no end! I love round robins because I get to see techniques in person that I have not tried yet and it is so inspiring to step out of your comfort zone and try them too! Since I had the pleasure of being the last to stitch on Ms. Bamboo before she flew off home I had a lovely treat of feasting on all the stitching eye candy that had come before mine. Thank you, Dee, for sharing the picture of Ms. Bamboo in her assembled beauty. I have written a bit before here on some work I was doing on her so I was very pleased to have your permission to post this picture of her finished as a followup. I hope Emily will love her! 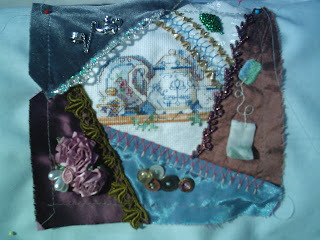 Well, the little teacup block is finished now so I'll take it to Guild on Friday. I did a beaded tea leave in the upper right hand corner. In the lower left hand corner I placed some premade ribbon roses and pearl teadrops and to the right of that a button cluster with some old buttons I lucked into at the thrift store. There is a copper one, a mother of pearl, one metal one as well as a vintage painted metal button. The last one i a vintage Slovakian glass button. I did a beaded feather stitch seam by the tea bag and constructed another seam under the teapot charm with sequins and silver lined glass seed beads. All in all I'm quite pleased with how the block turnd out - it is time for it to be done anyway!